I have had several garlands hanging in my bedroom, from my overhead closets. Now It was time for a new one. In reddish colours. I used 8 different colours. Mostly cotton yarn. 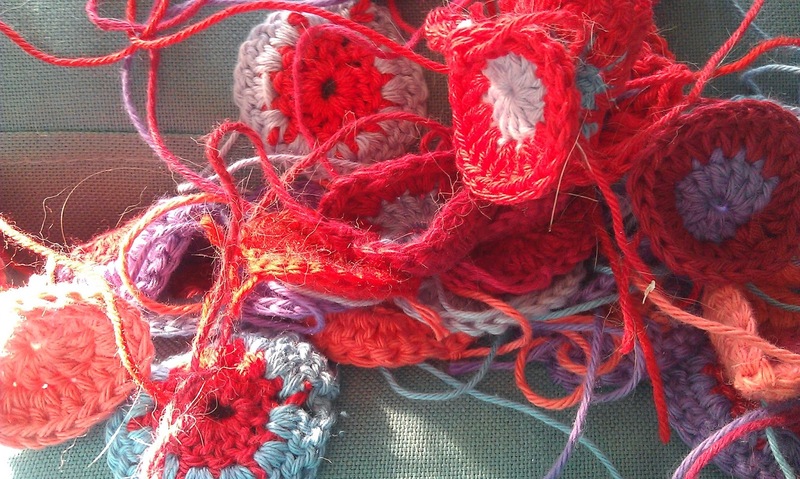 First lots of round pieces were crocheted, some two coloured. I crocheted in most of the ends as I went, so I didn't have to sew them in later. Leaving just the last end. onto where I sewed the round pieces with their said last unsewed ends. Then I continued to crochet two strings onto the red string in places. A darker red and a purple. So there were 3 strings in all with round pieces sewed onto them. - Also called a garland. Then I fastened the garland onto my overhead closets with tape. but didn't really like it, so I loosened them up a bit. Now it is as you see on the pictures. My bedroom does look a bit like an invasion of an Ikea kitchen. -Which makes sense since my closet is from Ikea, and it is the same as the ones in my kitchen. Because of that I try to add something to make it look more like an actual bedroom. Here the garland comes in, and the painting in the background. Which reminds me, that painting really isn't done. the next time I get a craving for painting. I actually haven't got any craft I am passionate about at the moment. Which is rather annoying. - And a tad boring. - so I at least don't feel like I am completely waisting my time. it is a shame not to spend all of those hours being creative you see. Such a waste of perfectly good usable time. Now I will drink another cup of Assam tea.